Sara Reed ’15 had a job in her field well before she graduated from Randolph. 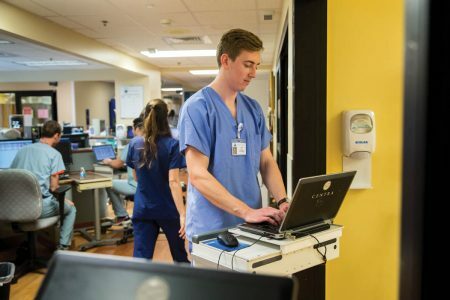 In fall 2014, the biology and dance double major entered the medical scribe program at Centra Lynchburg General Hospital. 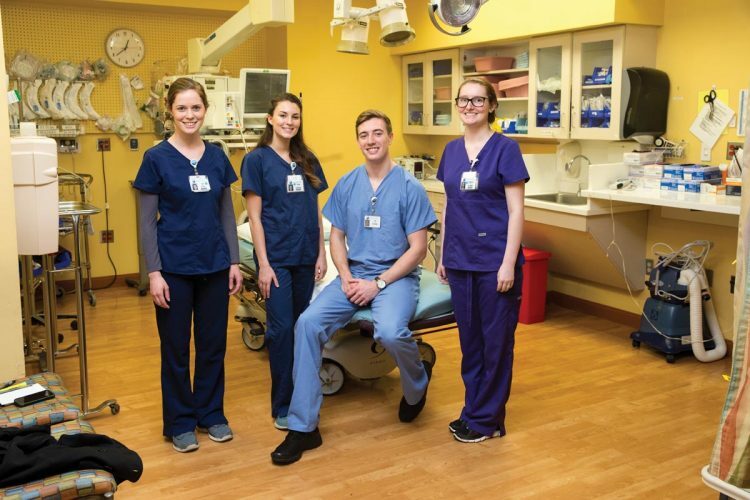 Now serving as Centra’s emergency department lead training scribe, Reed has since been joined by three other Randolph graduates: Joseph Uzdavinis ’17, Jessica Sidebottom ’17, and most recently, Dani Hill ’17. Sara Reed ’15 works with a doctor at Centra Lynchburg General Hospital. 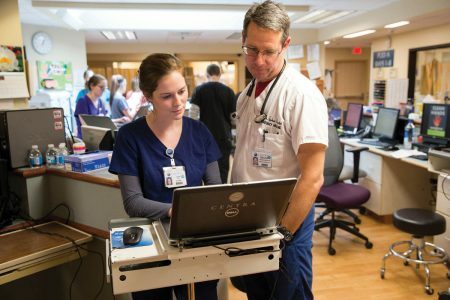 Designed to make physicians more efficient in documentation, medical scribes work 10–hour shifts, four days a week, recording patient–physician interaction, exams, history, procedures, progress notes, dispositions, and more. Medical scribes also serve as facilitators between a physician and others in the department. Reed is using the program as a means to network and gain experience for medical school and her long–term career goal of becoming a physician. She will start medical school at Lincoln Memorial University’s Debusk College of Osteopathic Medicine in Tennessee in the fall. Last October, Uzdavinis became the second Randolph graduate to enter the program. Like Reed, his lifelong dream is a career as a physician. Though he admitted there was a steep learning curve and that it can be difficult to acclimate to the fast–paced work environment, he felt prepared thanks to the rigorous coursework of his biology major and minors in chemistry and sport and exercise studies at Randolph. Joseph Uzdavinis ’17 began working at Centra Lynchburg General Hospital in October 2016. Sidebottom, who joined the program in January, said Randolph’s strong emphasis on both verbal and written communication skills has been key to her success. This spring, Hill became the fourth Randolph graduate to join the program. Reed said the close–knit group stays in close contact with one another, since their shifts often overlap. “I have been excited to see my alma mater have a larger representation in a program that provides such a unique and amazing opportunity,” she said.